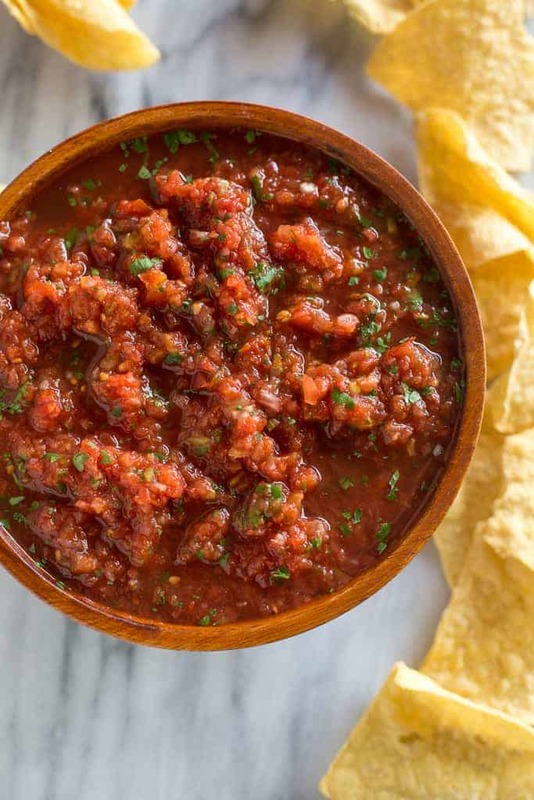 This really is the best 5-minute Homemade Salsa that tastes even better than what you’d enjoy at a Mexican restaurant. The ingredients are simple and inexpensive and it only takes a few minutes to make. 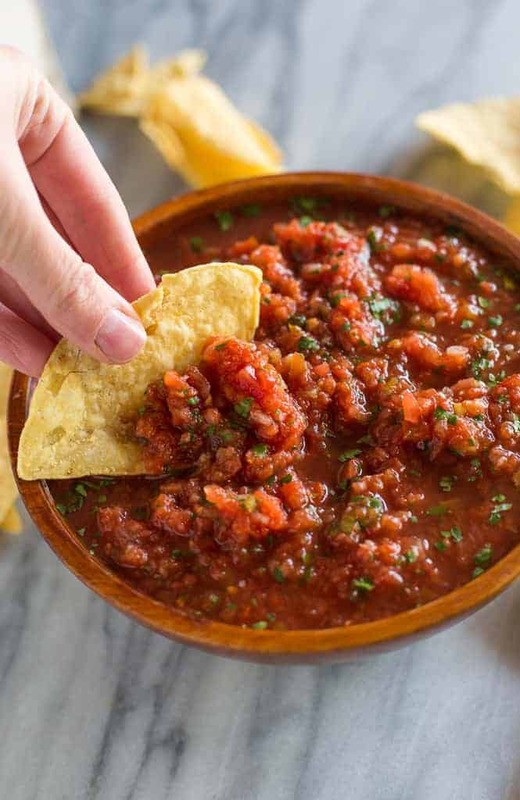 There is nothing EASIER than making homemade salsa and this recipe is absolutely restaurant quality. I love this version because it uses canned tomatoes but the taste is amazing and you can find the right ingredients all year long! I honestly like this version, made with canned tomatoes, even better than salsa made with fresh tomatoes. I think the color and taste are more similar to the type of salsa you get at a Mexican restaurant. However, I do have a great recipe for Fresh Homemade Salsa if you’d like to use fresh tomatoes instead. Add all of the ingredients to a food processor and pulse a few times, until you get the consistency you want. That’s it! Store homemade salsa in the fridge for up to one week. This is the salsa recipe I love to give as Christmas gifts to our friends and neighbors each year. 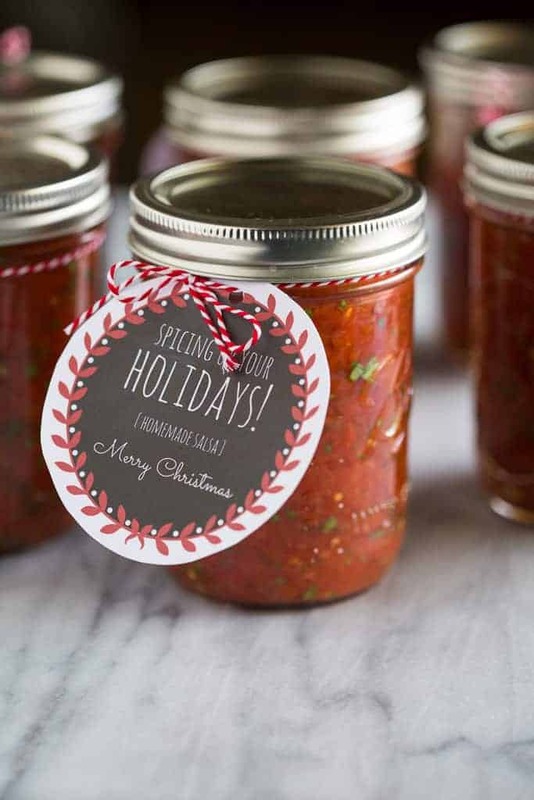 The recipe will fill 3 pint jars, and then I add this simple free printable tag from my friend Rebecca, over at Crafted Sparrow. So cute and easy, and it’s a refreshing change from all of the sweet treats people receive during the holidays. You can serve this salsa plain, with tortilla chips (it ever lasts longer than that at our house! ), or make a big batch to serve with other Mexican dishes or even over eggs with your morning breakfast. Check out all of my favorite Mexican food recipes to serve salsa with! How long will homemade salsa last in the refrigerator? Homemade salsa will last for about 1 week in the refrigerator! This really is the best, EASY Mexican-style salsa that tastes even better than what you'd enjoy at a restaurant. The ingredients are simple and inexpensive and it only takes 5 minutes to make! 2 teaspoons canned jalapeño peppers OPTIONAL, for hotter salsa (or use fresh). 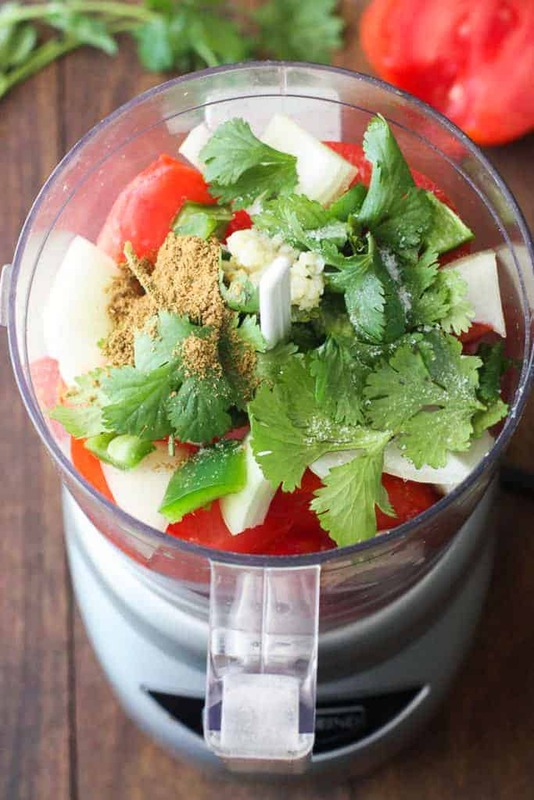 Add all ingredients to a food processor and pulse a few times until no large chunks remain. Taste and adjust seasonings, if needed, to taste. For best flavor, refrigerate salsa for at least 1-2 hours before serving. Store in the fridge for up to 1 week. This recipe makes a little less than 6 cups of salsa. I like to fill 3 pint jars and and share with friends and neighbors. Just made this to top with your crock pot chicken tacos, I’m in HEAVEN. This salsa is so quick to put together and the flavor is incredible. I use one can of Original Rotel and one of the mild. I always keep sliced jalapeños in a jar in my fridge so I threw in a couple of those for some heat and you’re right, tastes WAY better than a restaurant. I’m going to make another batch for this weekend! Thanks so much Kylie! I’m so glad you enjoyed the recipe! Delicious!! This recipe is a “keeper”. 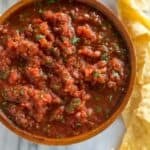 Such an easy, delicious salsa! Thanks for putting it out there! I’m obsessed with this salsa! Seriously so quick and absolutely addictive! Thank you! GREAT recipes! Way better than I expected. I only added a slight more salt that asked initially. But literally… a tiny bit. D-licious!! Did I mention we’ve tried a LOT of these “best homemade salsa” recipes? Hands down… best one yet!! May not even try any others! Well thank you Gary! What a nice compliment. Hope you get to try more of my Mexican recipes to go with it! Anxious to make this. What can I use instead of Cilantro. A personal hatred !